Hello dear reader to I will be comparing Note 9 VS Note 8. I will be comparing the two great Samsung phones. 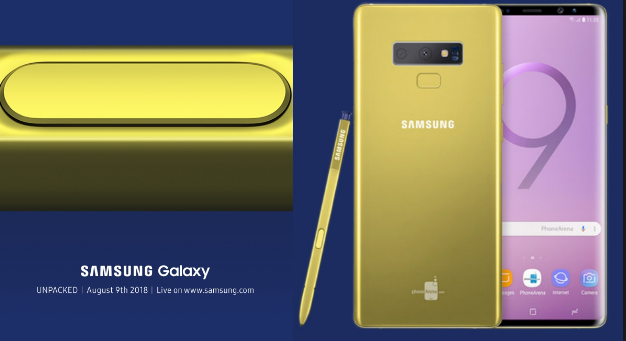 This means that this blog post contains both Samsung Galaxy Note 8 specs and Samsung Note 9 Specs. As we all know about the great phone that Samsung released last year Samsung Note 8 and the announcement of its higher brand coming into market this year. On might be wondering what is the different and interesting feature concerning the upcoming Galaxy Note 9 compared to Note 8. I will be discussing details and comparing both Samsung products in details. Many have asked me is they should upgrade to the new Samsung product. This blog post will help you make your choice. Note 9 VS Note 8, What is New? I will love to tell you guys the features and specifications of each product, compare the features. Note 8 have wonderful features but I must tell you that Samsung Note 9 is blazing. To me this phone might make the biggest sell on 2018 market. Everyone is patiently waiting for the phone to official release. 1. It has GSM/HSPA/LTE network. This makes the phone faster and reliable, increase and fast in browsing. 2. Screen resolution of 1440 x 2960 pixel, 18.5:9 with size of 6.4 inches. I ,must say this is super cool unilike others that comes with 5.5 and above inches. 5. Internal memory capacity of 64/128/256 GB and internal memory of 8GB. 6. Samsung Note 9 has card slot of 512 GB with dual sim model. 7. It has dual camera of 12MP and 8MP, back and front respectively. As all know about Samsung camera model, although I was expecting Note 9 to come with a higher mega pixel to me this is really disappointing. Never mind, Samsung camera is always promising and sharp. 8. Its battery has capacity of 4000 mAh and it is non removable. It can last for 112 hours. It’s duration is quite long. 9. Available in silver, Brown, Black, coral blue and lilac purple colour. 10. Sensor features are heart rate, Iris scanner, Fingerprint and accelerometer. Disclaimer: We are not 100% sure that the information provided about Note 9 VS Note 8 is Perfect. They might be a mistake, but my team always workhard to give you the best information. 1. It has 6.3 inches size with 1440 x 2960 pixels, 18.5:9 ratio. 2. 162.5 x 74.8 x 8.6 mm dimension. 3. 12MP/ 8MP of back and front camera respectively with LED flash panorama and auto-HDR. Dual video recorder, HDR, 2160p@30fps. 4. Operating system of Android 7.1.1 (Nougat), which can be upgraded to Android 8 (Oreo). 6. Internal storage memory of 64/128/256 GB and 6 RAM capacity. It has card slot of 512 GB and uses dual sim. 7. 89 hours of battery life duration. 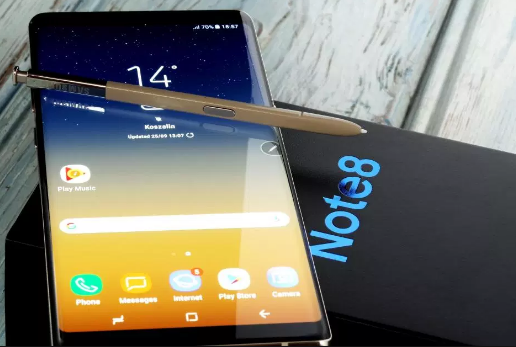 Now you have known the features of Samsung Galaxy Note 8 and Samsung Galaxy Note 9. Now let’s compare their features and see the difference and similarities. As you can see from the above specifications of both mobile phones there is no much difference in the design. The last year brand has an excellent design, so I don’t expect Samsung to improve a well detailed design. The phone size and resolution remain same having 6.3 inches size with 1440 x 2960 pixels respectively. The interesting change in design should be the S pen which is to come is a bright yellow form. Its fingerprint, camera and other things concerning the design are in right same position. That to show you that there is no much difference in Note 9 VS Note 8 designs. In specs they is a huge change, I know you will be expecting much difference in a year you should. The android operating system is quite different from Note 9 and note 8. Note 8 have Operating system of Android 7.1.1 (Nougat), which can be upgraded to Android 8 (Oreo), while Note 9 has operating system of Android 8.1 oreo. This is where the big difference lies, and with this Note 9 has a higher processing speed than Note 8. In the storage capacity there is much improvement. Note 8 has 64/128/256 GB and 6 RAM capacity. While Note 9 have internal storage of 64/128/256 GB and internal memory of 8GB. It has card slot of 512 GB and uses dual sim. In features there is no much change. The features of note 9 are to be same with note 8. The only difference is that Note 9 should offer wireless charging, 3.5mm audio port and fast charging. Both android mobile of Samsung product is cool, but I must say that Note 9 is indeed a promising phone. Even though there is no much difference between Note 9 and Note 8. Concerning purchasing the phone, I will say is matter of personal choice but to me; I will prefer Note 9 to Note 8 base on my usage. The major difference lies in the storage capacity, operating system and battery duration. These features make Note 9 far better than note 8. 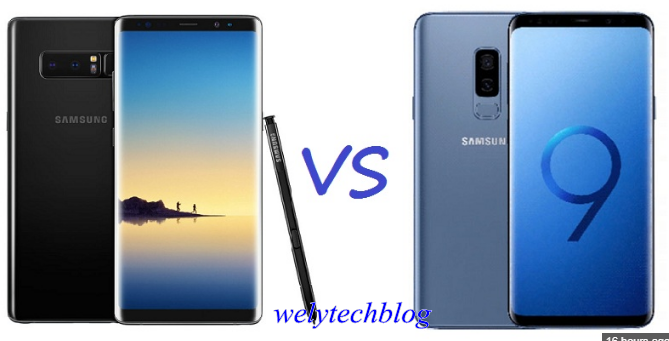 This review or comparison on Note 9 VS Note is done for it to help you are make a suitable choice for yourself. I really hope is of help…. If so, why not share with friends and family. They might need it. Use the social media button below to share with friends.